All tool users, irrespective of whether they are construction workers, welders, carpenters, installers, contractor, technician, mechanic, or electricians, need a means of carrying their tools as they work or when moving from one workstation to the next. The need for a tool bag is mainly informed by the fact that tools, left lying around on various surfaces, are likely to be damaged, misplaced, or pilferage. All tool users, therefore, need a sturdy, durable, functional and flexible tool bag to protect their delicate and precious tools against these possibilities. In the search for the best or most suitable tool bag you need to pay attention to a few important factors before making a choice. You could, for instance, pay attention to the level of construction, number and spaciousness of pockets, the comfortability of the tool bag and maybe affordability if you’re working on a tight budget. You need a tool bag that allows for easy and quick access to all the tools which makes those with an open-topped design the preference of many professionals. The other advantage of an open-top design is that it enables you to store your bulkier and larger tools with ease. Unfortunately, picking one tool bag from a sea of tool bags is a daunting and sometimes frustrating endeavor, what with having to read, no pun intended, through several tool forums, customer reviews and sites, and even social media posts. To easily unite you with your stitched, industrial-grade and weather resistant tool bag, we’ve taken it upon ourselves to put together a list of ten of the best tool bags on the market today. These tool bags have everything a tool user needs from flexibility, durability, more than enough space and affordability. The billing of the Custom LeatherCraft 1539 as the ultimate tool carrier is not a mistake. For most technicians, construction workers and even plumbers, carrying one tool is really not an option. These groups of professionals need a sturdy and rugged tool bag to allow them conveniently and easily carry several tools at a go, whether these are impact drivers, drills, screwdrivers, circular saws, or reciprocating saws. While they have the option of using cheaply-priced and readily available standard backpacks, these lack the adequate space for storing several power tools and other smaller accessories. In enters the Custom LeatherCraft 1539 carrier. The design and construction make it particularly ideal for plumbers, electricians, and general carpentry. The tool is nonetheless versatile enough to be used by other professional groups like installers, repair technicians, and just about anyone who likes the convenience and ease of transporting several power tools and accessories in large storage pockets. Not even a premium price tag should come between you and the Custom LeatherCraft 1539, especially considering that it has plenty of room for storage and a sturdy shoulder strap that evenly distributes the weight throughout your body, thereby saving your back the agony. The largemouth design makes it possible for the zipper to reach the very bottom meaning that you'll have an easy time locating any screws or nuts within the tool bag without dumping it out. It comes with 50 pockets of various sizes and shapes, as is the case with most other tool bags currently flooding the market. The one feature that easily sets the tool bag apart from all the crowded competition, however, is the fact that it sports a considerably larger centre storage space as well as a metal frame opening for keeping the mouth wide open. As a result, considering the size of the centre storage area, you have more than adequate space for holding all the tools and equipment you frequently use for performing your craft. There is also additional room for other accessories like a water bottle. When we say this carrier has space, what we mean is lots of space. 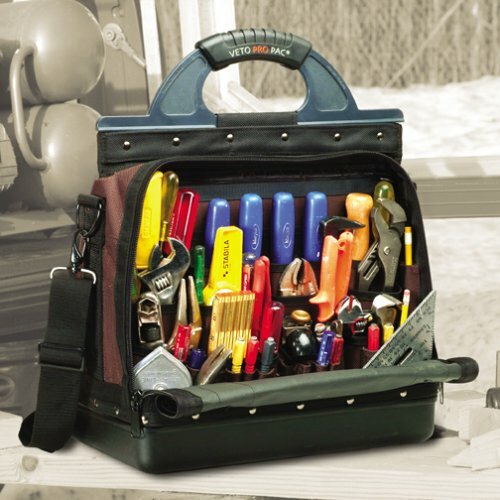 When properly arranged, the tool bag can easily accommodate four power and hand tools in addition to other big and bulky accessories like rulers and hammers. Such massive space saves you the time and effort of having to walk from the job site back to your car or workstation in search of a required tool which allows you to concentrate on the task at hand, thereby augmenting your productivity. The construction is done using high-quality and durable materials so it can stand the harshest and most abusive work environments and situations without registering even a point drop in performance. The professional construction ensures your tools remain safe and intact if you accidentally drop the bag on abrasive surfaces. Even after several hours of intense and heavy-duty use, the likelihood of the zipper breaking or the straps loosening is very remote. The vertical tool pockets of the carrier keep the tools in an upright position so you can easily reach out and pull the one you need effortlessly from the compartments without worrying about the bag tearing. Other than having a spacious centre storage space, it similarly features a heavy-duty and ultra-strong construction, so it lasts for the next several years without requiring replacement. The heavy-duty poly fabric body and poly ballistic trim and bidding are the results of rugged and professional construction. This tool bag also has double zippered top closure and side panels whose robustness keeps the tools safe and secure and guides against the possibility of any slipping out accidentally when the bag is strapped to the shoulder. In all, if you're seriously looking for convenience, durability, high-performance, and dependability, the Custom LeatherCraft 1539 is the perfect tool bag for you. The product comes with a very spacious centre storage area and several other vertical pockets for keeping your frequently used tools in sight so you can reach them easily and quickly. With its zippered top closure and side panels, there very little chance of your tools slipping out accidentally when walking or running with the bag strapped to your shoulder. So versatile and flexible is the bag that it can be used by professionals from nearly all fields, be they installers, plumbers, carpenters, or electricians. The high-quality construction of the tool bag is also apparent with its poly-fabric body and trim, double-pull zippers and the padded adjustable shoulder strap. 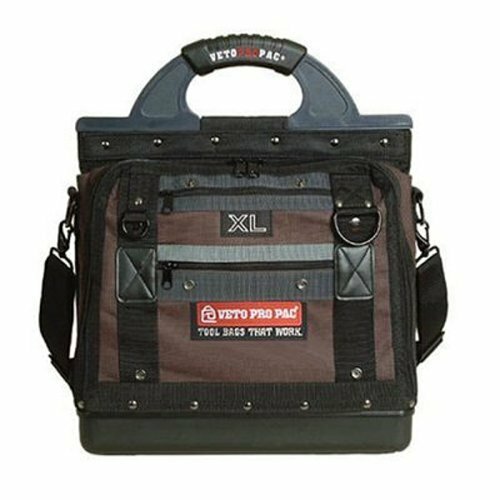 The VETO PRO PAC Model XL scores highly in many important areas that include but not limited to durability, availability of several pockets, and the use of a high-quality construction material. The product is first of all very professionally made and boasts incredible storing capacity which inevitably makes it an ideal choice for those whose jobs necessitate the use of several tools simultaneously such as technicians, repairmen and professional construction workers. An astounding feature is its ability to comfortably accommodate 100 or more hand tools, meaning that you'll always have the tools you need to complete the projects at hand efficiently and on time. The huge storing capacity also eliminates the cumbersomeness of carrying two or more bags or having to transverse your workstation in search of tools you've misplaced, which would, in turn, affect your productivity. It comes with two storage bays strategically located on either side so allow for quick and easy accessibility to the tools within. The fact that the two bays have identical storing capacity allows you to comfortably balance the tools bag on your shoulder or hand in addition to making it easy for you to achieve some level of organization. As a result, you'll always be aware of the tools and equipment stored in the two bays so that you don't spend endless hours searching. One of the most important highlights of thebag is the fact that is sports the brand's copyrighted panel design that ensures the complete separation of the two bays from one another and is fitted with vertical pockets for easy storage of differently shaped tools and equipment. The bag is home to sixty-seven pocket, each coming in a different shape from each other. Sixty-one of these pockets have vertical shapes to make it easy to store similarly shaped tools with ease while the remaining six are reserved for any other tools that won't fit with ease in the vertically shaped tool storages. In most cases, repairmen, electricians, construction workers and other professionals have these smaller accessories that would otherwise be difficult to find when stored in the larger compartments. To address this problem, the manufacturers thoughtfully included four smaller zipper pockets on the outside for keeping them so you can easily and quickly fish them when the need arises. The exceptional construction makes it an ideal choice for those working in strenuous conditions and therefore in need of an equally rugged and ultra-strong tool bag. In this regard, the tool bag is equipped with zippers and substantially large tabs that are ultra-strong and long-lasting and can withstand heavy use. The heavy-duty, nylon stitching makes it possible for the bag to smoothly tolerate extreme use while substantially prolonging its shelf-life by several years. Just in case you were wondering, the body fabric of the tool bag is constructed entirely from 1800 PVC impregnated denier meaning that it can stand up to all weather conditions including rain. The bottom of the tool bag is also made from polypropylene which ensures water does not sip in when placed on a wet surface. Additionally, the fastenings and zippers are all ultra-strong for incredible durability. The bag is one of a handful of tools bags that feature an ergonomic design to increase ease of use. 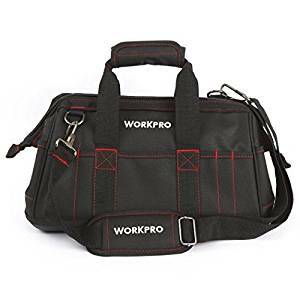 To make it easy to carry the tool bag within the workstation or while moving around from one job to another, the shoulder strap features an ergonomic design that involves over-molding the grip, non-slip padding and is slightly wider. It is similarly lightweight and compact with the width, length, and height standing at just 9-1/2-inches, 18-1/2-inches, and 13-1/2-inches, respectively. Consequently, you'll have an easy time transporting or commuting with it as it doesn't take up too much storage space. In conclusion, the Veto Pro Pac Model is an all-purpose tool bag for hauling all sorts of tools and accessories. The professional designing of the bag’s two bays allows for the effortless accommodation of more than 100 tools of various sizes and shapes. The tool bag also features an ergonomic design with comfortable shoulder straps. The tool bag is adequately durable and rugged enough to withstand different working environments especially considering the reinforcement and strength of the leather edging, weatherproof body fabric and the water-resistant base. Carrying the bag is made easy with its lightweight and compact design meaning you’ll experience considerably less fatigue. The Klein Tools bag is yet another all-purpose option that's perfect for hauling tools and accessories of different types and sizes both at home and on the work site. While the product comes in various versions, they have identical features and serve the same functions of helping you move from one place to another with all your important tools safely and securely in tow. Now let's delve a little deeper into the features and specs of the Klein Tools Tradesman Pro Organizer Rolling Tool Bag that make it stand out from the crowded competition. The ergonomic design is yet another aspect that cannot go unmentioned. Using the tool bag is quite easy and won’t put too much strain on your hands or shoulder due to the inclusion of a long-lasting telescoping handle. Unlike typical tool bags, the handle and strap are specifically engineered to reduce fatigue and prevent straining the back for those who will be carrying on their hands or shoulders for prolonged durations. The bag is, therefore, one of the safest you'll come across out there. Aside from protecting you, the bag does an incredible job keeping your tools safe and secure. It sports a unique molded kick plate for safeguarding the bag and its contents from high impact and vibrations. The implication here is that in the event you accidentally drop the bag, which is unlikely given the anti-slip properties of the shoulder strap and handle, both the hardy and delicate tools will survive without a scratch or bump. 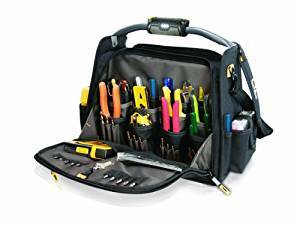 The same cannot be said for the other hastily and poorly constructed tool bags out there, meaning that the Klein Tools Tradesman Pro Organizer Rolling Tool Bag is worth considering seriously if you don't to be buying or repairing your tools now and then. To allow for the easy and quick assortment of your various tools, it comes with 24 strategically positioned and large pockets for storing your tools and any other accessories. The orange colouring of the bag's interior for a good contrasting background against which you can quickly identify and subsequently reach various tools. If you're just starting out, you may end up with a lot of space now but which shortly will come handy as you assortment or collection of power and hand tools grows. With a total weight capacity of 200 pounds, you may be worried about portability when the tool bag is fully loaded. However, you'll be pleased to learn that the bag is fitted with 6-inch base wheels that are strong enough to allow for hauling both on rough and soft terrains. In finishing, we'll highlight the key features of the Klein Tools bag. This option is a perfect choice if you're looking for convenience and organization. The unit has a maximum weight capacity of 200 pounds which you'll be able to haul over all types of terrain thanks to the inclusion of six 6-inch wheels at the base. For additional convenience, the tool bag comes with a reinforced metal frame to keep the lid open while loading or offloading your tools. It's similarly fitted with a molded kick plate for protecting the internal components of the bag from all weather conditions, whether it's rain, extreme temperatures, or snow. The tool bag comes with 24 spacious pockets with an orange colour interior for easy identification of tools. Lastly, the bag has a heavy-duty telescoping handle enabling you to move between different workstations with ease without straining your back or shoulders. It will go a long way in helping to keep your tools safe, secure, organized and within easy reach. A worthy investment for busy technicians, electricians, maintenance, and repair workers. Of all the tool bags reviewed on this list, only the Custom LeatherCraft L245 is equipped with an LED light feature, making it effortlessly stand out from the crowded competition. The LED light feature is a handy and thoughtful inclusion and will be particularly helpful if you occasionally have to work in a poorly lit environment. As all workmen can attest, it's tremendously difficult and nearly futile attempting to identify and pull out a specific tool from a crowded compartment when the lighting conditions aren't up to the task. One is forced to waste crucial time sifting through the tools and strain their eyes. But with the LED light, it will take you a matter of seconds to spot a specific tool and eliminates the need to use flashlights when you need to fish out a specific tool. The ready availability of sufficiently bright LED light also enables you to respond to an emergency at any time of the night much faster which essentially makes the Custom LeatherCraft L245 one of the best emergency response kits. Plus, you have the freedom of setting the light to three different levels: low, medium, and high. The feature makes it possible for you to easily adapt to different workstations depending on their lighting conditions while conserving the batteries better. As far as storing space goes, the Cag is one of the most spacious you’ll find out there. It has dimensions of 18-inches by 10-inches by 13-inches and with such wide dimensions come a plenty of space to store some of the bulkier and longer power and hand tools and still have enough space for the smaller ones. The main compartment has lots of space to allow you organize and arrange your tools in an order that you find most convenient. With 42 differently shaped and sized pockets in the interior and another 18 on the outside, you can distribute the tools in a way that will enable you to reach the frequently used ones first. 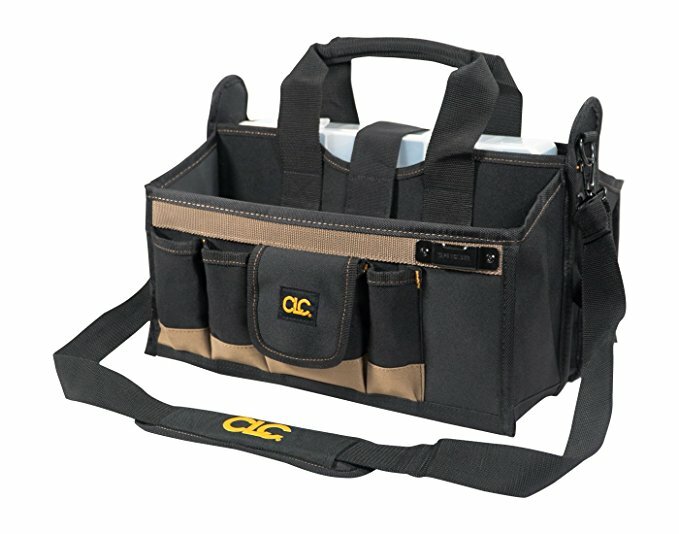 Whether you are an electrician, construction worker, and plumber or do those jobs that necessitate carrying several tools at a go, the bag has you covered. Like most tool bags in its class, this one too has a mini compartment for holding smaller accessories like bottles of water and tape measure and the like so that you don't lose them. The implication here is that sometimes it can get pretty heavy to comfortably haul around from one workstation to another or within an expansive work environment. Luckily, the tool bag is equipped with convenient shoulder straps to facilitate portability. The extra padding of the shoulder straps, their ergonomic design, their adjustability and the addition of anti-slip properties mean that however heavy the tool bag is, you can comfortably carry it with you without risking breaking your back or straining your hands and shoulders. Additionally, the padding of the base feet ensures your tools, from the most delicate to the toughest, are always protected from abrasions and high impact occasioned by the accidental dropping of the bag or hitting a hard surface. The padded base feet also aim at protecting the bag from the wear and tear resulting from everyday use in harsh working conditions which in turn prolongs its shelf-life. All Custom LeatherCraft L245 purchases come with a 90-day limited warranty, so you have a peace of mind when transporting your tools around. And considering the heavy-duty and rugged construction of the tool bag, you may never have to use the warranty at all as the chances of the tool bag disappointing you are very minimal. To reiterate, the Custom LeatherCraft L245 is an ideal tool bag for those who like organization and convenience, and it's an all-around tool for performing maintenance all-around the clock. Swivelling the light allows you to focus on a specific area and to easily fish out tools from within the bag when the lighting conditions are not conducive. The bag has 56 pockets located strategically both inside and on the outside for loading all the tools you need. And when it becomes a little heavy, the ergonomic handle helps in reducing stress on the hands and wrists. The shoulder strap is padded and easy to adjust. Lastly, it comes with base feet for reducing tear and wear and protecting the bag and its contents from abrasions. 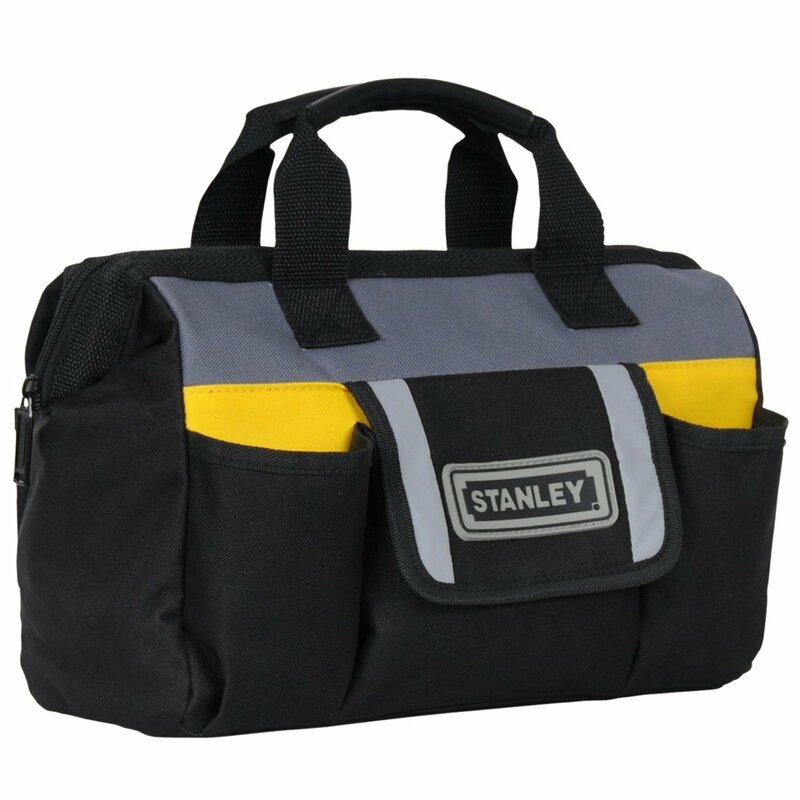 The design of the Stanley STST70574 bag makes it a perfect choice for those in search of a durable and long-lasting bag for keeping their tools either when working on a busy work site or just around the house. The tool is packed with several useful and practical features all of which have propelled it to the fifth position on our list of ten of the best tool bags to pay attention to. Aside from the apparently sturdy and professional construction, the Stanley STST70574 has one of the most snug shoulder straps of all the products on this list. The easy-to-adjust shoulder strap allows you to quickly reach any of the tools you may need within the bag in a matter of seconds. Like most shoulder straps, this one aims to make it easy to carry the tool bag plus all its contents with ease without worrying about straining your hands, arms, wrists, straining your back or shoulders. The design of the shoulder strap prevents the possibility of it digging into your shoulder as you walk briskly or run when the bag is loaded. As is the case with the shoulder strap, the Stanley STST70574 similarly sports very cozy and snugly handles. The fact that they are padded with high-quality and dense cotton reduces the burden on the shoulders and in some occasions eliminates the pressure that comes from carrying a big bag full of all sorts of hand and power tools. The high-quality, ultra-strong handles give you an entirely different experience. The versatility is another feature that will most likely appeal to you as it does to a majority of carpenters, welders, electricians, plumbers and construction workers. Its design makes it possible for you to use it to store all sorts of hand and power tools as well as other smaller and medium equipment. The Stanley tool has constructed the bag with the user in mind, understanding that those working long shifts will inevitably require additional space to store smaller accessories and personal items like a snack or bottle of water. To make this a reality, the tool bag sports useful and convenient outer mesh pockets for this purpose. You, therefore, have adequate space to squeeze in your flashlight if you’re afraid of working in poorly lit conditions or just want to be prepared for any eventuality. And when it comes to its most fundamental function, keeping your tools safe, secure and intact at all times, the STST70574 never disappoints. The use of rubber foams at the bottom effectively keeps all the tools within protected. Not a single tool, however small or delicate, is going to break or suffer an unsightly bump should you inadvertently drop the bag or hit some other hardened surface or item. The only drawback is the poor quality construction of the zippers which therefore calls for a little caution on your part when closing or opening the bag. The Stanley STST70574 has several attractive features. It is a budget-friendly tool bag that offers you all the specs only found in top-tier models. If your eyes are set on durability, ruggedness, convenience, and a generous allocation of space for way less money, then it's high time you took a long and serious look at this tool bag. The tool bag is constructed from a long-lasting fabric that seamlessly stands much of the tool load. It has two ergonomically designed hand straps padded with cotton to enable you to carry the bag comfortably and with little effort. The bag also has a rubber foam bottom for safeguarding the bag and its contents from the high impacts of a hard fall, in addition to providing sturdiness. Plus, it has quite an appealing appearance that might tempt you to use it for regular chores. 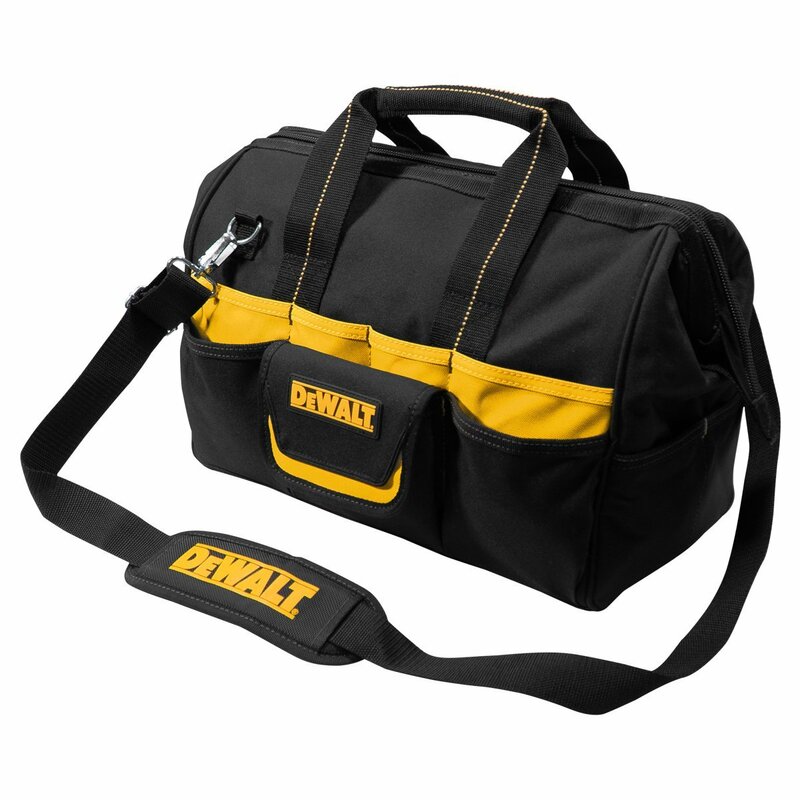 One of the many advantages of going with DeWalt is that its products are synonymous with high quality, exceptional performance, and unmatched durability, and these are some of the desirable features that the DeWalt DG5543 16-Inch bag brings to the table. Aside from ticking all the right boxes, the product reeks of sophistication and professional construction. The first thing that will immediately strike you about this tool bag is the pop-open design of its spacious central compartment. Its ingenious construction considerably simplifies the process of packing and retrieving power and hand tools located within. The bag also comes with smaller storing pockets both on the inside and outside to enable you efficiently and effortlessly organize smaller accessories that include nails, screws, nuts, and bolts. With more than twenty pockets on the outside, you have the freedom of strategically packing and organizing your most used tools so you can reach them with ease and speed. The interior is just as attractive and functional as the outside. It's no slouch when it comes to the generous allocation of space. If you carry delicate tools and equipment with you from one station to another, you need a suitable place for holding them as you move about. To this end, the tool bag features a total of 13 zippered pockets that are perfect for storing the more delicate tools, ensuring they don't fall off. There is also one flap-covered pocket that comes with a hook & loop closure for securing important tools and items. It's worth pointing out that the zipper is not only double pull but also very heavy-duty. As is with all DeWalt products, the DeWalt DG5543 comes in a sturdy, rugged, and high-quality construction to ensure it continues providing you with reliable service for the next several years. The tool bag is reinforced with heavy polyester fabric in all the critical parts that are more vulnerable to wear and tear. These parts include the corners and edges. The body of the bag is made from heavy-duty poly and ballistic poly fabric. The base, for instance, is fitted with four high-quality pads to guide it and the tools within from the destructive consequences of rough floor surfaces. Irrespective of the degree of abrasiveness of different floor surfaces or their conditions – whether they have corrosive and contaminating liquids like oils and grease – your tools will still maintain their optimal performance condition. The padding likewise does an incredible job protecting both the bag and the tools from high impact resulting from being accidentally dropped and guarantees no bumps. The DeWalt DG5543 delivers exceptional portability through the use of its shoulder straps. The padding of the shoulder strap of the bag goes a long way in protecting your shoulders, hands, and wrists from the burden of carrying a heavy weight most of the time. The padding simultaneously reduces the strain on the strain, prolonging its shelf-life by several years. You can quickly access the various tools within the bag by adjusting the height of the shoulder strap which also comes with non-slip properties to firmly secure it on your shoulders. The handles have extra padding and non-slip properties for the same reasons. 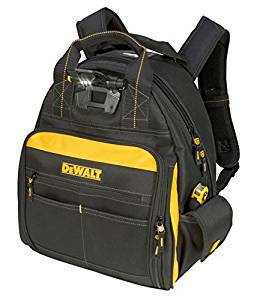 If you were ever at all looking for proof of DeWalt expertise and knowledge in manufacturing durable, high-performing and top-quality products, this bag is sufficient evidence. The pop-open design of its spacious central compartment allows you a quick and easy access to the tools within. It has several pockets for easy organization and arrangement. The edges and corners and the bottom are all padded to keep the bag and tools from water and dirt and to protect against tear and wear. 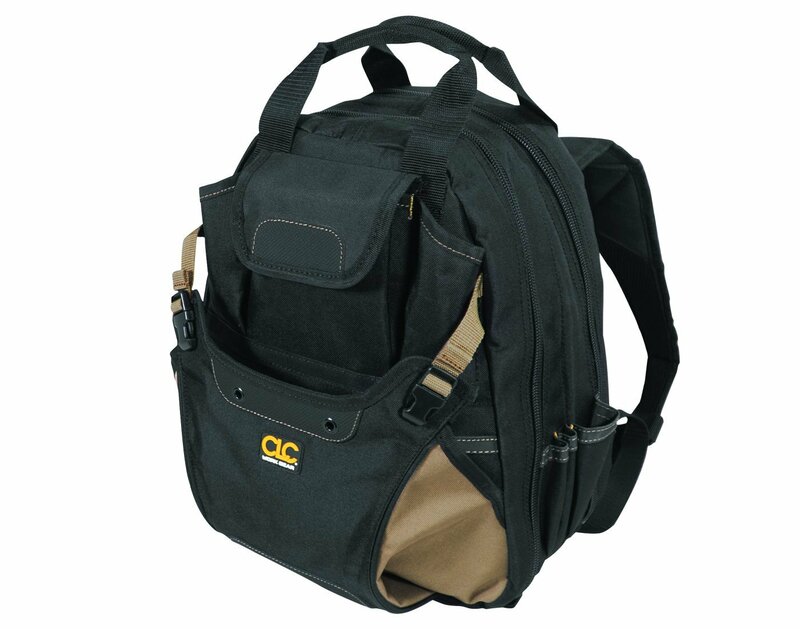 Portability is facilitated through the inclusion of comfortable and slip-resistant handles and shoulder strap. With all the spacious pockets inside and on the outside plus the sturdy design, we don’t see why the DeWalt DG5543 cannot become your go-to tool bag for keeping your tools safe and secure when you are on the move or working. If you're looking for an elegance tool bag reeking of sophistication and high-quality construction, you might want to pay considerable attention to the Custom LeatherCraft 1134 Carpenter's backpack with 44 pockets. Aside from its aesthetically appealing look, the tool bag has numerous features that make it a worthwhile investment for keeping your tools and equipment safe and secure. As the name suggests, the tool bag has a backpack design meaning you'll have two straps going down each shoulder, and this is likely to put a lot of pressure on these parts as well as the back. To guide against fatigue and aching of the shoulders and hands, the backpack comes with padded chest straps to prevent the heavy weight from hurting your shoulders. The handle similarly features an ergonomic design and is equipped with anti-slip properties while the straps have a height adjustable feature to allow you reach the tools quickly and easily. As far as storing space goes, it offers you one of the largest main compartments. It has a total of 44 pockets on the outside and outside and some of them have adjustable compression properties to ease carrying larger and bulkier tools. With such lots of space at your disposal, you can comfortably bring your power tools and hand tools both on the inside and outside. The easy to access compartment at the top of the tool bag is for holding all those tools and accessories you use on more frequently and those that you might want to reach quickly without venturing inside the tool bag. Both the compartments are zippered with one specifically dedicated for holding tools and parts while the second one is for both battery-operated and electricity-operated drills. The biggest advantage to owning a tool bag backpack is flexibility. Because the straps go over your hands, your hands are free to attend to other things related to the task you intend on undertaking. You could, for instance, carry the bulkier and larger tools and equipment that can't fit into the backpack, climb up or a ladder, or even use your mobile device as you work. It is such flexibility that endears the backpack to carpenters, welders, technicians, installers and even electricians all over the world. Being a lightweight and compact tool bag, the only time you'll be putting it down is when you're performing a heavy-duty task that requires you to move from one location to the next a little faster. To recap, the Custom LeatherCraft 1134 is a perfect alternative for plumbers, electricians, welders, carpenters and all other professionals who are constantly on the move with several tools in tow. The preference for the tool is particularly informed by its flexibility, coming in the design of a backpack which conveniently frees up your hands for other job-related tasks like climbing ladders or carrying more tools. It is lightweight yet sufficiently rugged and capable of taking on the most difficult tasks thrown its way. Plus, it features budget-friendly price tag under $60. Boasting extra padding for all its straps and grips, the keeps your tools and items safe and secure at all times. The DeWalt DGL523 57-Pockets bag is the results of the combined efforts, resources and expertise and experience of two of the biggest manufacturers of tool bags: DeWalt and Custom LeatherCraft. Anyone familiar with the two firm's dedication to the production of high-quality, high performing and durable products will need little conviction to understand that the tool bag backpack is innovative as it is spacious. The design of the bag makes it possible for any professional, irrespective of their field, to store accessories, parts, and tools of varying sizes without worrying about running out of space. Consequently, the bag is the best choice for you and a quick search on some leading seller websites like Amazon.com will prove as much. Some of the accessories and tools the backpack can comfortably hold include but not limited to corded and cordless drills, power cords, electrical testers, screwdrivers, among others. The bag's ability to bear such a heavy load is made possible by the use of heavy-duty material during construction. To comfortably hold all these variously sized items and tools, the bag is fitted with 48 multi-purpose pockets on the interior and another nine on the outside. The design aims at helping you organize the tools so that the ones you use most frequently are held in the front zippered pouch with pockets for quick and unhindered access while the most delicate ones are stored on the inside where the possibility of being damaged or bumped is significantly less. It sports an ergonomic design to make it easy to use. To this end, the pads on the back feature additional large padding to increase levels of comfort when you are using the tool bag backpack. The padded back makes it possible for you to bear extra weight without risking pain on the back and shoulders. The shoulder straps, as you would expect by now, are similarly padded to absorb the heavy weight. The inclusion of base pad feet go a long way in reducing wear and tear and abrasion occasioned by using the tool bag backpack in tough and harsh conditions, thereby prolonging its shelf-life. For any serious goal-oriented and self-motivated professional in search of a functional yet affordable tool bag backpack, a clear picture will emerge. The DeWalt DGL523 is without a doubt an unrivalled tool bag, providing you with all the features you're looking in addition to many more aimed at increasing your convenience and easing your burden. The tool bag backpack, for instance, is equipped with a useful and functional LED light that you can easily direct inside the tool bag to allow for the quick and accurate identification of tools and other accessories. And should you find yourself working in a poorly lit work settings, simply direct it to a specific spot and use the brightness adjustment functionality to expand the illumination area or chose to focus the light onto a specific spot for close-up work. If you're looking for a tool bag backpack with great ideas and oozing sophistication, the DeWalt DGL523 is specifically meant for you. The bag has 57 pockets with enough room to comfortably carry some bulky and large tools and accessories like cordless and corded drills, battery packs, and several screwdrivers. The tool bag eliminates the difficulty of working or finding the right tool in poorly lit conditions as it comes with a movable LED light. 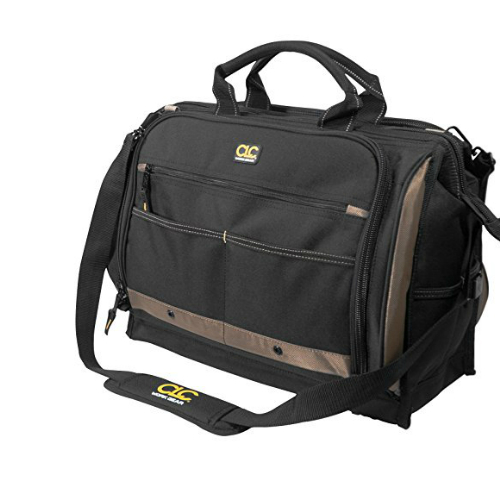 For comfort, the bag features padded straps, back, and base so you can carry it with ease around the workstation or when moving from one station to another. If you're working on a budget but can't stand the idea of compromising on quality, durability, and performance, then the Custom LeatherCraft 1529 may just be the tool bag for you. Even though it's a budget pick, this tool bag easily rivals its pricier and top-placed counterparts like Veto Pro Pac and Stanley STST70574 models in all important considerations. With this tool bag, you get some 16 spacious pockets for the easy organization of all your accessories, tools, and equipment. The largest of the storage compartments is strategically placed at the centre for keeping the bulkiest of your tools secure. The individually placed compartments on the outside are ideal for storing hand tools that you usually use frequently. The vertical placement of the interior pockets is aimed at increasing the visibility of the tools stored there so you can quickly reach them when the need arises. 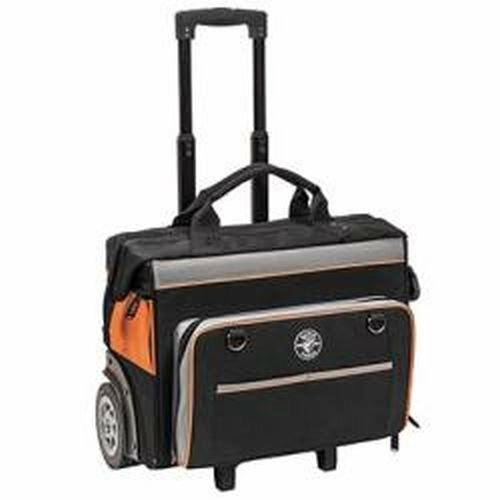 However, because the bag lacks the hook and loop feature of the more premium tool bags, tools placed in this compartments stand a high chance of falling off and getting lost which consequently calls for extra caution on your part. The company's response in guarding against such a possibility is including web loops to better accommodate large handle tools. The central placement and professional design of the tool bag's plastic tray is simply a bold and game-changing innovation as it significantly increases the bag's holding capacity by several tools. For additional convenience, the design of the Custom LeatherCraft 1529 makes it possible for you to change the sizes of the various compartments to match the size and shape of specific items. In an attempt to allow you a quick and unhindered access to the tools placed on the inside, it features an open-top design which allows you to accurately locate and retrieve the tool you need in a fraction of the time it would take with other bags. Other than boasting of 8 pockets on the outside and another 7 on the inside, it also comes with other features for enhancing your convenience. For instance, it has an electrical tape strap and a tape measure clip. In addition to these features, the shoulders are padded with high-quality material, so you have an easy time carrying the loaded tool bag as you work, walk or run on different terrains without it straining your back or shoulders. Such ergonomic design is its highest selling poins, making it an all-around and go-to tool bag for most electricians, tradesmen, installers, carpenters, and plumbers, among others. So perfect is the Cbag in its construction that we had to give it a second and third evaluation to find any faults. After careful consideration, our only recommendation is that the manufacturer put a little more thought into reinforcing the base/bottom and the sides of the bag to prevent it from constantly collapsing whenever the plastic tray is removed. We noticed that the zipper, despite its heavy-duty construction, tends to stick frequently when pulled a little quickly. These are however minor drawbacks that are easily overshadowed by the tool bag's exceptional design and durability. Other things considered, the Custom LeatherCraft 1529is a worthwhile investment coming at a pocket-friendly price, and you have a 30-day money-back guarantee from the time of purchase. In conclusion, this is a quality option with a total of 17 pockets for safely holding your precious tools and accessories. It has all the features to meet all your needs whether your career is just beginning to pick up or already established. To make it comfortable and suitable for prolonged use, the Custom LeatherCraft 1529 features a secured web carrying handle and a modifiable shoulder strap, both of which are padded. If you have a plethora of tools in your workshop and have a difficult time moving with them collectively from one spot to another or from one workstation to another, consider getting the durable and heavy-duty WORKPRO 16-Inch Tool Bag with Waterproof Molded Base. This bag is unique in several ways. The use of the long-lasting rugged 600D Polyester fabric for the construction of the tool bag ensures it's sufficiently rugged and strong enough to accommodate several bulky and large tools easily. It comes with pockets located on the inside with 3 others on each of the sides and another two along both ends. The fact that the pockets have a depth of 4.5-inches, almost identical in size and bulgy makes them perfect for keeping tape measures, pliers, and other tools. You also get outer mesh pocket stores for storing your most delicate items like MP3 players and even your phone and other smaller tools and accessories like nuts and screws. With all its pockets and belts, you'll have an easy time organizing and securing your tools and accessories, ensuring the most frequently used are within quick reach. The bag eliminates the need to dig fish around the bag trying to locate just one tool, wasting valuable time in the process. The bottom of the tool bag is molded with rubber foam for keeping water, dirt, corrosive and contaminating agents from reaching the insides of the bags. Couple this with the extra padding of the tool bag’s base and you have a tool capable of withstanding the hardest floors or the unconducive floor surfaces of most workstations. Apart from the high-quality and professional construction, it similarly comes with a user-friendly design to make it possible for people of different ages to use it with ease. To this end, it has an adjustable strap that goes over one shoulder. You can have an easy and quick access to the tools and accessories contained in the bag by simply changing the height of the strap to match your requirements. Because of the bag comes with several spacious pockets, you're likely to fall for the temptation to stack it with as many tools as it can carry, meaning that at some point it will get considerably heavy. To prevent the shoulder strap from digging into your shoulder in such cases, the straps are padded with dense and high-quality materials, which also make easy to move with the tool bag briskly around the workstation. To further facilitate easy and quick access to the tools, both the sides of the tool bag are padded between the inner and outer canvas layers in a move aimed at stiffening them and helping keep the bag open for as long as required so you can pull out the tools and accessories you need with little hindrance. For those looking for a professional and flexible tool bag for holding their most frequently used tools and accessories, look no further than the WORKPRO. It's an attractive and productive option that goes a long way in helping you keep your tools organized for easy access and transportation. While it's not ideal for some bulkier tools and accessories, it's nonetheless a perfect option for achieving some level of comfort and flexibility for all the installers, plumbers, carpenters, electricians, construction workers, and repairmen out there. Sturdy, capable of withstanding heavy-duty use and yet comfortable is how we can best describe the WORKPRO bag. If you’re just starting out or you’re an already established professional, the chances are that you’ll probably want to grow your tool collection with time. With this in mind, you need to shop for a future-proof tool bag, one that will comfortably accommodate the ever-increasing number. The design and size of your preferred bag should provide you with enough direction in determining whether the bag will adequately meet your future needs. You need something that is neither too big nor too small, and the best way of striking the sweet spot between the two is accessing your current and possible future needs. Even though most tool bags have padded shoulder straps, backs, and handles to reduce the burden of carrying heavy weight, you still need to determine the load you can carry. Frequently carrying excess weight could be detrimental to your physical well-being. The quality of a too bag depends, to a great extent, on its level of organization. The organization structure of a tool bag will determine whether you can carry many tools without necessarily cramming them in one place. Poorly organized bags won’t be able to accommodate as many tools as their more organized counterparts, which is something you may already know. Bags featuring a wide open mouth design and fitted with several compartments and pockets of varying sizes are better at holding a wide range of tools and sizes. Your preferred tool bag should sport both large and small compartments, the large ones for storing hand and power tools while the smaller pockets and compartments for screws and nails. So that you don’t run the risk of losing such small items and accessories, these small pockets come with zippers and look and hoop features for securing their contents. More premium and costly tool bag models have hooks, clips, and even D-rings so you can easily attach different tools. Your tool bag is only as durable as the material used for its construction. In case you settle for a tool bag constructed from thin, weak and poorly-quality materials, you’ll be shopping for a new one in a very short time. Given the sensitivity and cost of most hand and power tools, it would be prudent to never compromise on the quality of the tool bag. Look for a tool bag constructed from durable, rugged, and ultra-strong materials that include but not limited to canvas, nylon, and molded plastic. Some tool bags sport metal frame on the mouth or opening to ensure they remain open for as long as desired so storing and retrieving tools is easy and quick. Others have foam lining on the interior to cushion the tools against the hard impacts like when the bag is accidentally dropped or when it hits an abrasive surface. Others, on the other hand, are made from weather-proof materials to safeguard the bag and its contents from adverse weather conditions like rain, water and extreme temperatures. You might also want to get a bag with heavy-duty and long-lasting fasteners and zippers capable of withstanding intense use over a longer period before they break or become unusable. If you can, get a tool bag with most of these properties and you’ll be assured of reliable and unfaltering service for the next several years. Some tools are heavy and bulky, and this may make moving around from one job to another a little difficult. For greater portability, select a tool bag that has the right weight and space. A majority of tool bags come with shoulder straps and handles to makes it easy to move about with a lot of comforts and much quicker. If yours comes with padded, wider and sturdier straps, we don’t expect you to experience any difficulties with weight or portability, as these parts absorb most of the pressure and guide against the straps digging into your shoulders or hands. In case your job involves carrying really bulky and large tools, consider getting a bag with base wheels and a retractable handle with telescopic and height-adjustable properties as these will go a long way in not only guaranteeing your comfort but also that you move seamlessly. Q: What is the best way for cleaning my tool bag without ruining it? A: Simply using a piece of soft cloth and lukewarm soapy water should help you get rid of all dirt. Avoid using hot water as it could trigger a chemical reaction with the construction material which could end up ruining the bag. If the stains are stubborn, however, consider combining the warm soapy water with some clean water. Also, make a point of regularly cleaning the tool bag to avoid accumulation of dirt, preferably every other week. When properly done, the tool bag will maintain its fresh and new look for a long time. Q: Any recommendations on the types of tools to keep in? A: As the name suggests, a tool bag is for holding tools that you frequently use. The larger and more spacious the bag, the more tools it will be able to hold comfortably, though. A majority of tool bags can comfortably hold standard screwdrivers and wrenches. Others come fitted with loops and hooks on the outside for holding bulkier and larger tools such as hammers. If you have saws and other longer tools, there’s a high chance most tool bogs won’t meet your needs. You could try using a rolling tool bag even though they won’t have the portability of their standard counterparts. All the tool bags featured on our list are both high-quality, high-performing, flexible and durable. Plus, you don’t have to break any banks to own one. Most of them go for way below $60 with sometimes very little difference in the quality of construction and performance. The bags are a worthy investment and will provide you with a convenient, effortless and efficient way of moving with your frequently used tools while working from one place to another. The beauty of these tool bags is that they are lightweight and compact and will enable you to maneuver your way between hard-to-reach spots without putting too much strain on your body. The most important factor to take into consideration before ordering one online or from the local store is your needs now and in the future. Once you’ve considered this factor and the ones we enumerated, you’ll be ready to make an informed decision. We wish you all the best.